This blog is drawn from the Housing Finance in Africa Yearbook 2015. If cities are built the way they are financed (Renaud, 1984), then Africa’s cities are set to change. Innovation in housing finance –in terms of products, players, and approaches, not to mention target markets – is a key feature across the continent, creating new opportunities for investment and delivery. As both local and international investors chase growth opportunities in a sluggish global economy, they are employing diversification strategies to manage the risks of their traditional targets – and in this, residential property is increasingly becoming an option. And while established players are getting better at what they do, new players are adding to the mix and competing for opportunities. Investors are faced with a paradox, however. By their very nature, they are drawn to the high income markets. It is in these markets that they can price adequately for risk and realize the returns they seek. However, the real story – the scale opportunity just waiting to be cracked – is in the lower income market segments. The arguments for investment in residential – high urbanization rates, a growing middle class, a shortage of supply – these are all arguments for moving down market into the uncharted waters of affordable housing. Can investors and developers do it? In 2015, this is a very real focus. Of course, the challenges are not insignificant, and cannot be easily wished away. But increasingly, investors and developers are noting that the potential benefits outweigh the risks. And, as governments come to appreciate the potential that this interest offers, their efforts to streamline development processes and enable their local housing markets to grow are creating new opportunities that are beginning to change the face of African cities. Given this, investors have been looking for innovative ways to make the connection between their capital and potential investment opportunities. The introduction of Real Estate Investment Trusts (REITs) is perhaps the most significant of these – these create a vehicle that investors understand and can trust, aggregating diverse sources of funding from international and institutional investors through to households, and targeting them into a portfolio that extends beyond the limitations of individual projects. REITs are new in Africa – having developed through the promulgation of legislation and issuing of regulations only in the past three years, in South Africa, Nigeria, Tanzania, Kenya, Ghana, Morocco, and Zimbabwe. Initially used for the retail and commercial real estate sectors, residential REITs are now also emerging. The first residential-only REIT in South Africa, Indluplace, listed on the Johannesburg Stock Exchange in June 2015. Promoted by Arrowhead Properties, which has been bringing residential properties into its REIT portfolios since 2013, Indluplace focuses on affordable rental. In some jurisdictions, the REIT legislation allows for a housing development focus. This was a Kenyan innovation, which allows for the Development REIT (D-REIT). Investors take some of the project risk, so the regulations limit D-REITs to professional investors. A D-REIT can be converted into an Income REIT (I-REIT) which realizes returns through rental cash flows, when the bulk of the assets have completed the construction phase and rentals begin to flow. In Tanzania, the Capital Markets and Securities Authority (CMSA) approved Watumishi Housing Company REIT in early 2015. WHC-REIT aims to mobilise funding for the development of low-middle income housing, both for sale and for rent, and the development of commercial properties. WHC-REIT was created explicitly to target public sector workers’ housing demand, and the Public Service Pension Fund, Government Employees Provident Fund, PPF Pension Fund, LAPF Pension Fund, National Security Authority, National Health Insurance Fund, and National Housing Corporation are the unit holders. Over time, WHC-REIT intends to float units on the Dar es Salaam Stock Exchange to allow members of the public to also invest. Listed groups create a credibility on which investors can rely. As listed groups – REITs and others – explore the affordable property sector, investors can begin to develop an understanding of this market opportunity through their arms-length relationships with developments that their investment in the REITs facilitate. Another innovation whose practice has been evolving as its been tried in different countries, is the mortgage liquidity facility. Originally introduced in Africa with the establishment of the Egyptian Mortgage Refinancing Company in 2007, this was soon followed by the establishment of the Tanzania Mortgage Refinance Company in 2010, the Caisse Regional de Refinancement Hypothecaire-UEMOA in 2012, and the Nigerian Mortgage Refinance Company in 2014. While there are variations from one to the next, the model essentially allows for the liquidity facility to purchase mortgages from mortgage lenders, giving them the liquidity to fund further mortgages. In order to engage with multiple lenders, the facility requires standardization of mortgages, which over time makes them more accessible to investors. Access to funding from the liquidity facility both reduces the cost of capital and increases the loan tenor, which in turn makes the mortgages much more affordable to borrowers, and lower income borrowers can then also participate. An increase in effective demand on this basis encourages developers to build to this market, and over time, the virtuous cycle sees more housing at more affordable prices for a widening market of borrowers. Mortgage markets across Africa are tiny by international comparisons, but this is part of their attraction – there is space to grow. Lower interest rates, achievable in part through liquidity facilities, seem to correlate with larger mortgage markets. But it is still early days and our data collection is imprecise. The data illustrated in the following graph comes from multiple sources – central banks, the Housing Finance Information Network (Hofinet), the World Bank, and from CAHF’s own research. 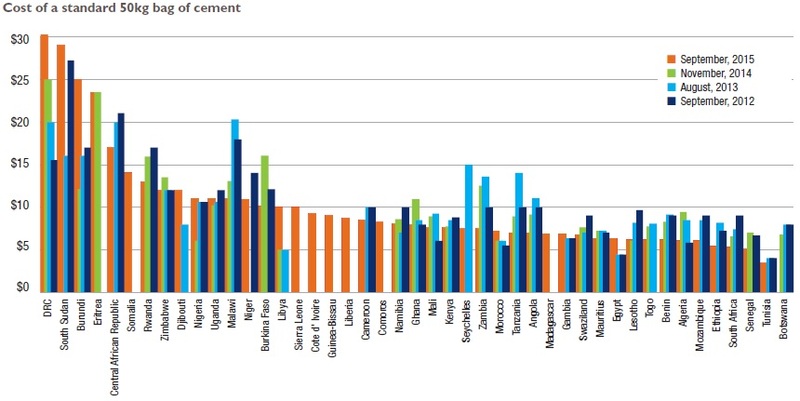 Aside from North African and certain markets such as South Africa, Namibia, most countries barely achieve 5 percent mortgage debt to GDP. Growing these markets will not only encourage investors to treat them more seriously, they will also encourage developers to be more targeted in their delivery, and this will support the economic development that the rest of the world knows goes with housing. Of course, mortgages are only feasible when they’re affordable. Mortgage rates above fifteen percent, and offered at tenors below ten years, are unhelpful. Beyond the factors that liquidity facilities address, macro-economic factors – the pricing of Treasury Bill rates, inflation, the availability of long term capital, the strength of capital markets, and so on – are behind a lender’s ability to make the mortgage work. In Malawi, a borrower might as well buy their house with their credit card. It is unsurprising therefore, that mortgages comprise only 0.5 percent of GDP. 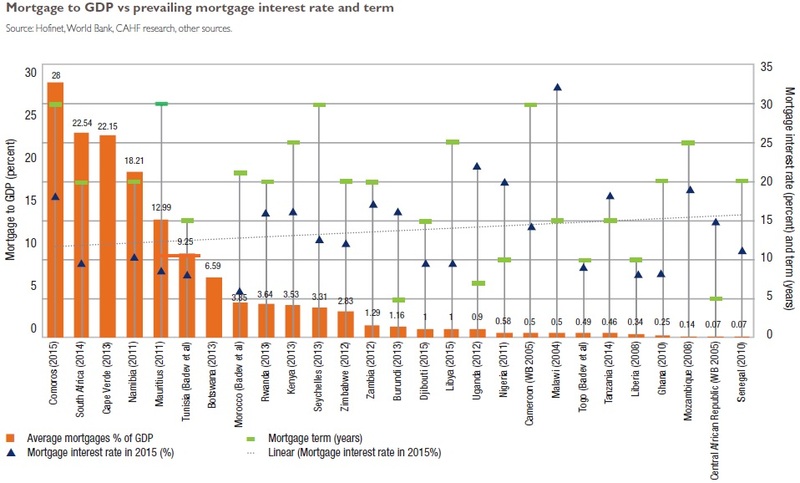 Interestingly, a number of countries are offering mortgages at rates below 15 percent and for tenors over 15 years, and some now at even less than 10 percent and over 20 years. Of course, exposure is still very limited. If booming Kenya is celebrated for its mortgage market of just over 22 013 mortgages as at the end of 2014, then we know mortgage markets are tiny and we can suspect that there is a substantial opportunity for growth. As mortgage markets develop further, they create exit opportunities for developers and construction financiers, supporting further investment in residential development, greater housing supply, and the growth of cities with more formal housing. New financing approaches are changing the shape and look of African cities. And yet, the enthusiasm with residential will be misplaced if it is only focused on the top end. The bulk of the backlog is not in the high end property market, but rather in what is being called the affordable market – home to new entrants to the middle class. 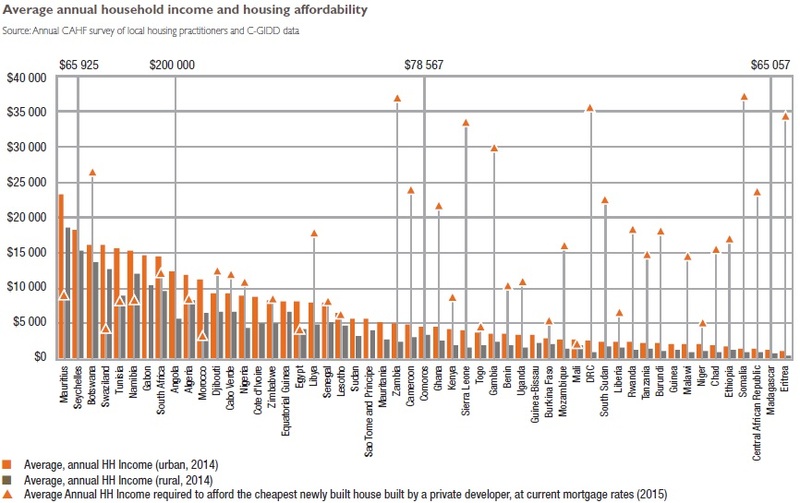 Affordability is higher in urban areas, of course, where residents are more likely to have an income stream that can support a long term mortgage obligation – but even so, less than ten percent of households across the continent are likely to afford a mortgage for even the cheapest, newly built house, built by a private developer. CAHF has been collecting data on house prices across Africa for the past six years. We ask two simple questions: what is the price of the cheapest, newly built house, built by a private developer, and what is the size of that house. The answers we receive tell us nothing about scale – we have no idea if enough of these houses are being built annually to satisfy demand, though we suspect that in most cases they’re not. And because most countries do not collect this data in any formal way, the information we receive cannot be taken as representative – the responses we receive are based on the opinions and experience of the respondents. However, it gives us an indication of the range of house prices, the possible relationship this may have to size, and what this means for housing affordability. If we compare this data with average annual household income in urban and rural areas, we can see some countries with very serious gaps, which, in most cases, are not easily overcome with end-user finance. Given these affordability challenges, and the very real need and obvious demand for housing, investors and developers are targeting specific niche markets that pull together resources in innovative ways. An important niche is the rental market. This was the focus of two recent symposia hosted by development financier Shelter Afrique this year, one of which was in Ghana. Across these two events, proponents highlighted the opportunity for regular cash flow and increasing rentals as a hedge against the long term expectation for property appreciation. The rental sector offers strong synergies with pension fund liabilities, and provides opportunities for diversification. Demand is obvious: Africa’s cities are welcoming streams of new migrants, and the middle class is young and both upwardly and geographically mobile in their pursuit of employment. This, plus the simple absence of housing for ownership, makes rental an obvious target. And critically, a growing track record is showing impressive results. Within the rental sector, student housing has been a critically overlooked housing niche. A key challenge in making this market segment work, has been the need for property managers that are specialist in this market segment. As the demand for diversification shifts practitioners in the direction of residential, however, the student niche offers a focus that is attracting some investors. In many countries, housing investors are targeting employers, whether public or private, as critical role players that can facilitate their workers’ access to the resources they need to pay for their housing. In South Africa, Pretoria Portland Cement has embarked on a “Home Owners Support Programme”, assisting its lower grade employees to improve their housing circumstances. Certainly, a key determinant of market demand is income – both in terms of quantum and source. The graphs that follow provide an indication of the nuance of this demand. This sort of market segmentation can enable a more careful targeting, and changes the affordability challenge. While the majority of households cannot afford the mortgage that would buy them the cheapest, newly built house by a private developer, they may afford to buy a plot of land, servicing it collectively with members of their community, and then financing the incremental construction of their housing in stages, using housing microfinance. As we better understand the size and scope of housing affordability – even at the very general level offered by these graphs – we can better understand what sorts of investment can be targeted where, and what sort of market will support these kinds of decisions. Housing affordability and urban population figures bring into sharp focus the relevance of the recent trend of megacities. Across the continent, greenfield city projects are being developed: mixed residential, commercial and retail developments, such as Kenya’s Garden City, which opened in September 2015. Others include Tatu City in Nairobi, Kenya; Eko Atlantic in Lagos, Nigeria; La Cite de Fleuve in Kinshasa, DRC; Hope City in Accra, Ghana; Kigamboni New City in Dar es Salaam, Tanzania; and Diamniadio Valley digital city, planned in Senegal11. These projects are hugely ambitious involving massive investments by the private sector and substantial regulatory support and administrative engagement by the public sector. But when the entry level unit in La Cite de Fleuve is US$190 000, or when Garden City yields a total of 400 units, their relevance for meeting the breadth of the demand comes into question. Will developers (and governments) manage to shift their efforts from these high value initiatives targeted at high net-worth individuals and the diaspora, to engaging with the realities of affordability that truly shape the backlogs on which their diversification and investment strategies are justified? This is the challenge of the future. A further perspective. The housing affordability story is significantly influenced by the price of building materials, and this is an issue that CAHF is exploring with its partners in the coming year. Key among these is the price of cement. If it takes 35-40 bags of cement for the construction of a 40m2 brick and mortar house, the per bag cost is a critical factor. 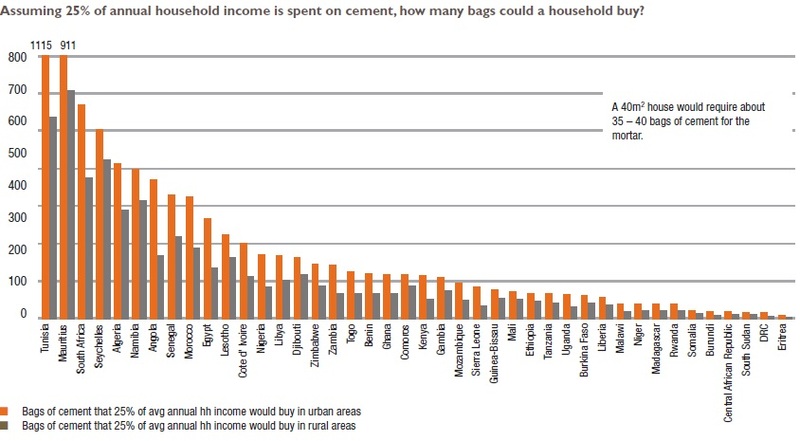 In 2015, the most expensive country with respect to cement, at US$30,30 for a 50kg bag, was the DRC, followed closely by South Sudan, where the same bag cost US$29,00. 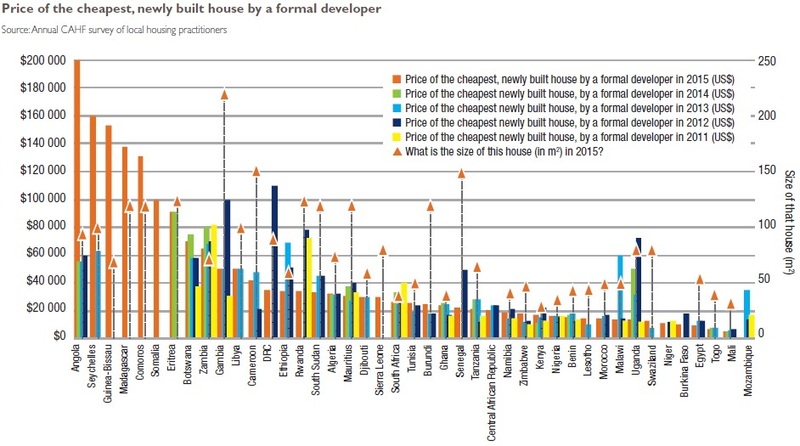 Compare this with Nigeria (US$11,00), Kenya (US$7,60), and Senegal (US$5,06), and the cheapest source of cement, Tunisia (US$3,53), and the capacity of a household to build their home with cement becomes somewhat more clear. Even in 2015, the key challenge that investors and developers highlight from their experiences across the continent, and including South Africa, is regulatory and policy uncertainty and instability. This factor is critically important because of the long term nature of housing investments. Unpredictable regulatory changes, complex legal frameworks and volatile local currencies all limit investment timeframes and challenge exit strategies, encouraging investors to look elsewhere while governments get their house in order, so to speak. Government policy can have a significant impact on investor interest and market participation, simply by being reliable. Access to land is a key factor, and regulatory challenges in this regard also undermine the capacity to deliver at scale. At the I H S affordable housing summit, a Nigerian developer, Resilient Africa, reported that of the ZAR28 billion (US$ 2.139 billion) worth of ‘large lot size property’ sold across the continent in 2014, ZAR26 billion (US$1.986 billion) was in South Africa. The ability to acquire large tracts of land for property development is constrained in very many jurisdictions by the capacity of local governments to package and present that land as required by legislation – and to administer and manage it over time, thereafter. 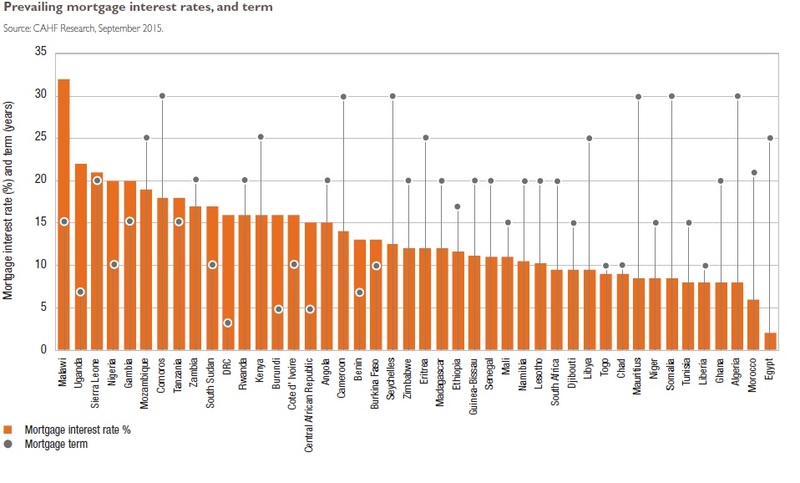 Niger, Togo, DRC, Cote d’Ivoire, Comoros, Sierra Leone, Senegal and Nigeria have all improved, with the most significant savings in Senegal. 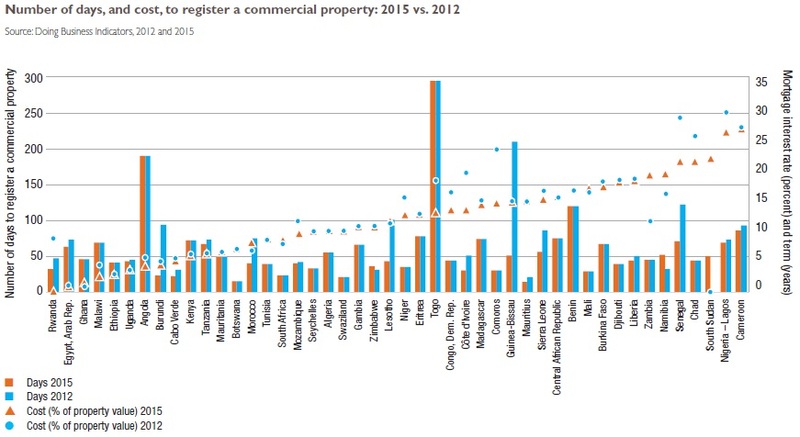 The cost of registering property in Zambia and Namibia increased in the period. As governments better come to understand the capacity that investors have to offer and the significant impact that their interest can have on the progress of their local housing markets, the incentive to address time delays and stumbling blocks becomes clear. World Bank support tied to the development of mortgage liquidity facilities in Egypt (previously) and currently in Tanzania, Nigeria and the WAEMU region, is having a significant impact, and in those countries, Central Banks are increasingly assertive in championing effective housing markets. This is also the case in South Africa, where the challenge of housing for the working class was an issue highlighted very recently by the national Finance Minister. 5. Growing experience and investor sophistication. Its worth noting that investors who have lasted this long aren’t frightened – and the potential returns are enough to keep them focused on the long haul. In June 2014, private equity investor I H S announced the first close of their second fund, following the strong, risk-adjusted returns achieved in its first fund, worth ZAR1,8 billion, which provided financing for over 28 000 units across South Africa. Announcing their second fund, I H S said that the strong returns achieved with the first fund provided clear proof that the affordable housing market, targeted at middle and low income earners, was a sound investment, and a strong base for ongoing inflows into the sector. residential real estate market in Kenya. many countries. The value of local currencies has also fallen – in Ghana, by as much as 50 percent. And political instability in many regions has made any sort of investment much more difficult. These factors haven’t changed the reality of an affordable housing shortage, however, and may well be stimulating investors and developers to think differently about what and to whom they deliver. The space for conversation is certainly opening up. Governments are much more open about partnering, whether formally through public-private partnerships, or simply through regular engagement with the private sector, to achieve goals they now realize to be mutual. In some cases, real capacity constraints hamper their efforts, but generally there are efforts to resolve these issues too. For its part, the private sector is beginning to understand the imperative of affordability, and the opportunities that open up when this is engaged with substantively. African cities are set to change dramatically – more houses for more people – as practitioners in both the public and private sectors pay increasing attention to the reality of and opportunity for investment in affordable housing. The full article with references can be accessed here. The 2018 country profile for Tunisia (as contained in the 2018 Housing Finance in Africa Yearbook) is also available as a separate pdf document.